Clanging bells and sombre piano chords set the mood for A Salty Dog, one of the most moving songs created by Procol Harum during their ten year career. The warning cry of 'All hands on deck' sends a chill of fear that only sailors in a storm might fully understand. It was typical of the band that they could create such atmosphere with the simplest of themes and phrases. Certainly the title track set a standard of excellence maintained throughout this remarkable album. 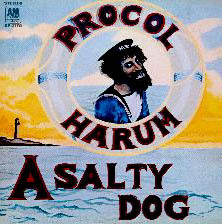 A Salty Dog, originally released in 1969, was Procol's third LP and their first to enter the UK charts at number 27. It seems extraordinary now to realize that the band which came to fame with the blockbusting 1967 hit A Whiter Shade Of Pale had to wait so long for recognition at home. But they had spent a lot of time touring abroad, particularly in America, where audiences were quick to realize that Procol Harum were not just one hit wonders. Here was a band of substance with many more tunes to play. But it took British audiences a while to cotton on. The combination of Gary Brooker's haunting vocals, Keith Reid's imaginative lyrics and Matthew Fisher's classical organ tones helped create the distinctive Procol Harum sound and style. Their appealing mixture of gospel, funk, soul and Bach was far more subtle than most contemporary rock. Sometimes mournful, sometimes obscure, there was, however, always a feeling that Procol were sending a message to its audience ultimately more rewarding than any number of hard rock riffs. Procol' songs had depth and the power to move mind as well as body. Released as a single, A Salty Dog reached Number 44 in the UK chart in 1969 and was a much bigger Top Twenty hit when reissued on a special maxi-single with A Whiter Shade Of Pale and Homburg in 1972. The album was recorded just before the departure of Matthew Fisher and their bass player Dave Knights who quit the band in March 1969. Knights wanted to take up management while Fisher intended to concentrate on production. They were replaced by Chris Copping who came in on bass and also played organ. The arrival of Copping, who had been at university, meant that Procol Harum now had the same line-up as The Paramounts, the R&B group which had launched Gary Brooker on the road to fame. Brooker (born May 29, 1945), had grown up in Southend-on-Sea, Essex, where he met guitarist Robin Trower (born March 9, 1945) and Chris Copping (born August 29, 1945) at school. Brooker had learned to play piano as a child, although he played banjo and guitar in his first skiffle group. He later learned how to adapt his piano and vocal style to a rock'n'roll band after discovering the music of Jerry Lee Lewis and Ray Charles. The Paramounts were formed in 1959, and by 1963 their line up included Gary Brooker (piano, vocals), Robin Trower (guitar), Chris Copping (bass) and BJ Wilson (drums). They played mainly covers of US R&B standards and had a chart hit with their version of Poison Ivy in 1964. They were hailed as one of Britain's best young R&B bands and appeared on TV and in clubs supporting the Rolling Stones. But by 1966 the band faced competition from their mentors, like James Brown, who were now touring Europe. There was less demand for covers bands no matter how good. Brooker had been on the road for some years and decided to retire! Instead of hammering the piano at one night stands, he would sit at home in Southend and concentrate on writing songs. He was friendly with DJ Guy Stevens, who worked for Island Records. Guy not only indoctrinated him with all the latest gospel, R&B and soul records from America, he introduced him to Keith Reid (born October 10, 1946), a brilliant young lyric-writer from London's East End. Keith sent Gary a package of lyrics which the pianist parked on his piano and promptly forgot. However, a week or so later he found them, was intrigued by the flow of ideas, and began setting the words to music. Gary phoned Keith, who came down to Southend, and the pair began a historic songwriting partnership. Their first efforts at writing for other artists met with little response, and they became disheartened. In the end Reid advised Brooker that he should sing the songs, while Guy Stevens encouraged them to form their own band. Guy Stevens came up with a name for the new outfit, taken from a friend's cat called Procol Harum. The song, based on Bach's Air On The G String with its surreal Reid lyrics, was played non-stop on pirate radio and eventually became a huge hit in France, Germany, England and America. It topped the UK charts for six weeks and got to Number 5 in the States where it sold a million. It eventually sold six million copies world-wide and was hailed as one of the greatest singles of all time. It was a hard act to follow, but the band returned with the equally imaginative Homburg, Quite Rightly So and Conquistador. Their first album Procol Harum (1967) was followed by Shine On Brightly (1968) both now re-issued on Repertoire CDs and packaged with fine performances. On A Salty Dog, tracks like The Milk Of Human Kindness, The Devil Came From Kansas and Wreck Of The Hesperus showed how Procol Harum were developing as a songwriting collective. Although all their past work had relied heavily on the Brooker-Reid collaboration, there was now the chance for others to have their way. The song's lyrics were heavy on metaphor and reversed meanings of words, a device that Keith Reid used a lot. A good example is the captain's phrase 'All hands on deck - I think we've run afloat' instead of 'aground'. Procol recorded A Salty Dog at EMI's Studio 2 at Abbey Road where they had a 'traps' cupboard packed with instruments which their predecessors The Shadows and The Beatles had loved to use on their records. Procol Harum went on to release Home (1970), Broken Barricades (1971), the highly successful Procol Harum In Concert With the Edmonton Symphony Orchestra (1972) and Grand Hotel (1973). In 1975 came Procol's Ninth but the final album, Something Magic (1977) failed to chart in the UK.